Musa is the type genus of the banana family (Musaceae), which contains 25-80 species of bananas and plantains. Both are important throughout the world for food, shelter, medicine, and even clothing. In production, bananas are the second largest fruit crop in the world, grown in warm and tropical climates across the globe. Bananas and plantains are often said to grow on trees, but actually it's a pseudostem (false stem). The fruit also develops without pollination, which means that bananas and plantains are "virgin" fruits, and are technically berries. 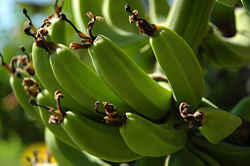 Their evident importance make bananas and plantains necessary plants for the global economy. Bananas and plantains are said to grow on trees, but in reality they grow from a large herb! Banana "trees" have a pseudostem (false stem) that is really a group of leaf stalks in a cylinder. These stalks can grow to be 20-25 ft. tall, and sprout from an underground stem called a corm or rhizome ("a thick underground horizontal stem that produces roots and has shoots that develop into new plants.") The corm eventually pushes up through the center of the pseudostem and produces a cluster of flowers called an inflorescence that later bear fruit. Each stalk only grows one inflorescence (flower cluster) before it dies. New stalks grow out of the corm. The banana leaves are some of the largest of all the plant species, reaching up to 9 ft. long and 2 ft. wide. They can be completely green, green on top and purple-red underneath, or green with maroon-splotches. Wind tends to shred the leaves, but the veins are still able to function properly. Each plant has about 5-15 leaves, but 10 leaves are considered the minimum for producing mature fruit. The reproduction of plantains and bananas is very unique. The fruits are produce parthenocarpically, or without pollination. The male flowers are sterile, and in some varieties so are the female flowers. The resulting fruit forms in clusters called "hands." 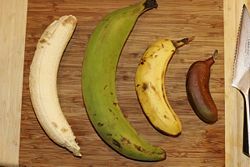 The bananas or plantains begin as a dark green, but gradually ripen to yellow, red, or even green-and-white striped. Their size ranges from 2 1/2 to 12 in. long and 3/4 to 2 in. in diameter. The fruit's shape is cylindrical and curved like a horn. The flesh of the fruit can be ivory white, yellow, or pinkish-yellow. The texture can be tough or gummy if unripe, and then ripens, becoming soft, slippery, or mealy. The flavor varies from sweet, mild, or even apple-like. Kluay Tod: Thai dish of fried bananas. Plantains and bananas serve many different purposes worldwide. Their leaves are used for plates, homemade umbrellas, and thatching (roofing); the pseudostems are made into rafts and benches. The fibers obtained from the pseudostem are used for fishing line in West Africa and fabric in the Philippines. In India, some banana fiber is even made into paper. Ash of dried peels from both bananas and plantains is used for dyeing and making soap. 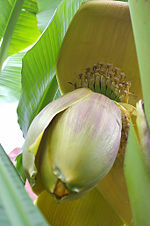 Various parts of the banana plant are medicinal, and used to treat anything from dysentery to burns and insect bites. These plants also contain natural antibiotics and fungicides, and are used as animal feed and fertilizer. Banana flowers sold in the market as vegetables. As a food, both plantains and bananas are eaten peeled, unpeeled, sliced, whole, ripe, or unripe. Baby food is made from banana puree, and the puree is also found in ice cream, cake, milkshakes, and other foods. Flour made from dried, unripe bananas and plantains has been mixed with wheat flour, and is used to make pastries. Fried banana and green plantain chips are popular snack foods similar to potato chips. In Africa, ripe bananas are fermented to make alcoholic beverages such as beer and wine. Musa balbisiana, a type of wild banana, has edible, male inflorescence buds that are eaten in Southeast Asia as vegetables. Young plant shoots are also cooked and considered greens in India. Grounded and roasted dried green plantains have been used as a coffee substitute. The international popularity of bananas makes them the second largest fruit crop in the world in terms of production, grown in 130 countries and producing 155 billion pounds. Plantains produce 72 billion pounds a year and occupy 12.8 million acres in 52 nations. These astounding figures attest to their international economic importance. Bunch of unripe green plantains. Banana stalks that have been cut to harvest bananas. "Orchard" of the edible banana plant (Musa acuminata). Abaca fiber from the Philippines made from the banana plant (Musa textilis). Banana California Rare Fruit Growers, Inc.
Banana Julia F. Morton. Purdue University- Department of Horticulture and Landscape Architecture. Banana and Plantain University of Georgia. This page was last modified on 13 July 2011, at 23:10.